Before moving to Cleveland Heights in May 2010 I lived in Solon for eight years. Solon has a lot of chain restaurants, but there are a few independent gems. One of my favorite restaurants there is Hunan of Solon. I would get take-out or eat in the restaurant at least every couple of weeks. So when Groupon offered a deal there last March I jumped at it. It was set to expire soon, so I grabbed a friend and took a night off from my juice fast (more on that another time) to enjoy some much-needed protein. Hunan of Solon is located in an unassuming strip mall on a dead end street leading to the Solon Regal Cinemas. According to Scene Magazine, it is operated by the same people who run Hunan by the Falls in Chagrin Falls. 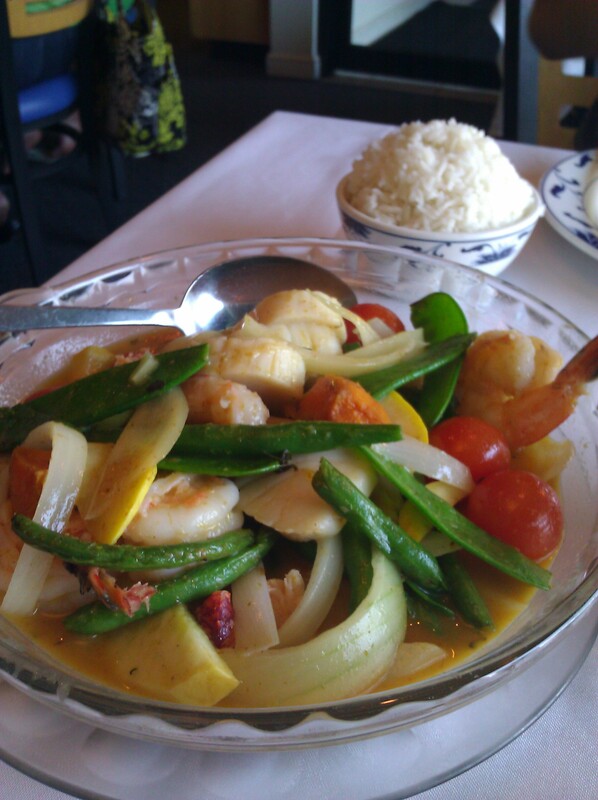 They won Cleveland Magazine’s 2008 Silver Spoon Award for Best Chinese for their salty prawns. It offers an “eclectic and ambitious menu” including Korean beef rib strips, shrimp tempura, garlic shrimp, Cantonese lobster, basil chicken, moo shu duck, and pad Thai and Thai curries. Their lobster dishes are prepared from fresh live-tanked lobster (word of warning – if you order lobster they simply chop it up and you will have to remove the shells yourself, which can get quite messy and isn’t attractive when dining with others – but most especially on a date!). They also serve bubble tea smoothies. According to Wikipedia, bubble tea contains a tea base mixed with fruit (or fruit syrup) and/or milk. Ice-blended versions of the drinks, similar to slushies, are also available, usually in fruit flavors. 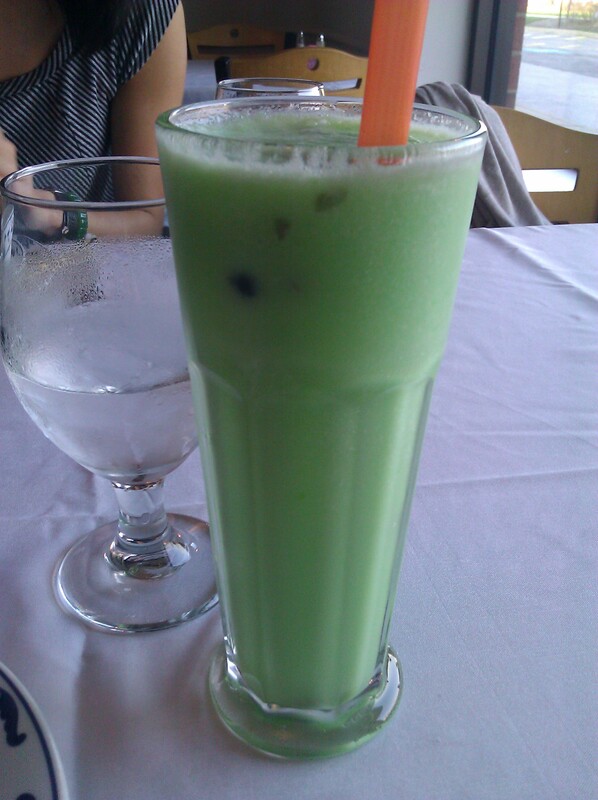 I ordered the honey dew bubble tea smoothie, which was rather sweeter than I expected, in honor of St. Patrick’s Day. I probably would have been better sticking to the green tea bubble tea smoothie. I dined there with my friend G., who is Chinese American. Once seated, our server quickly greeted us, asking G. if she was Chinese and then bringing her the Chinese menu. In all the times I have eaten here I had no idea they had a separate Chinese menu featuring more authentic dishes for Chinese palates. Looking at the website now I see that the “Authentic Chineses [sic] Menu” is featured there now. Having an Americanized palate and having anticipated the meal for at least a week, I knew exactly what I wanted already so I stuck with my tried and true favorites. We started off with a cup of wonton soup each. Hunan of Solon is known for their wonton soup. G. even admitted that it was better than her mother’s, which I consider to be high praise seeing as her parents are currently living in Beijing. 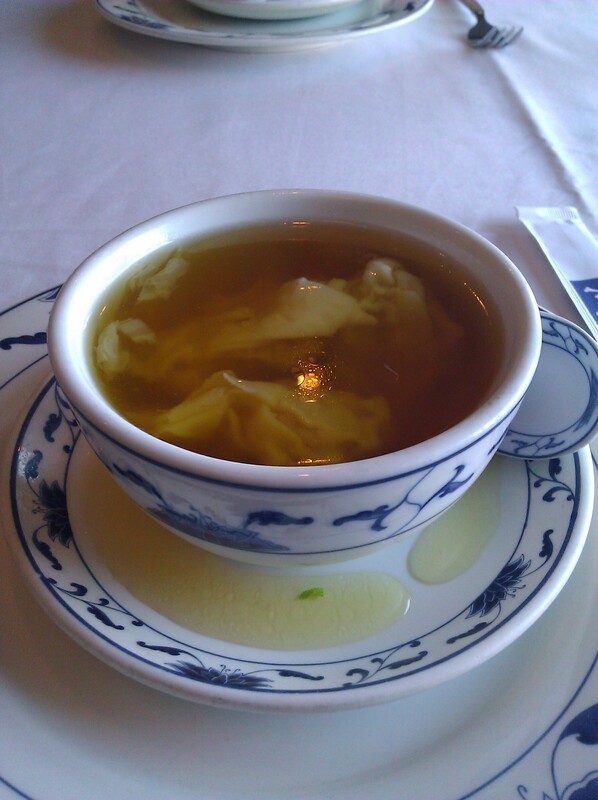 The broth is flavorful, and the wontons are dense and tasty (I apologize for the reflection off the broth in the photo). We both enjoyed every last drop. 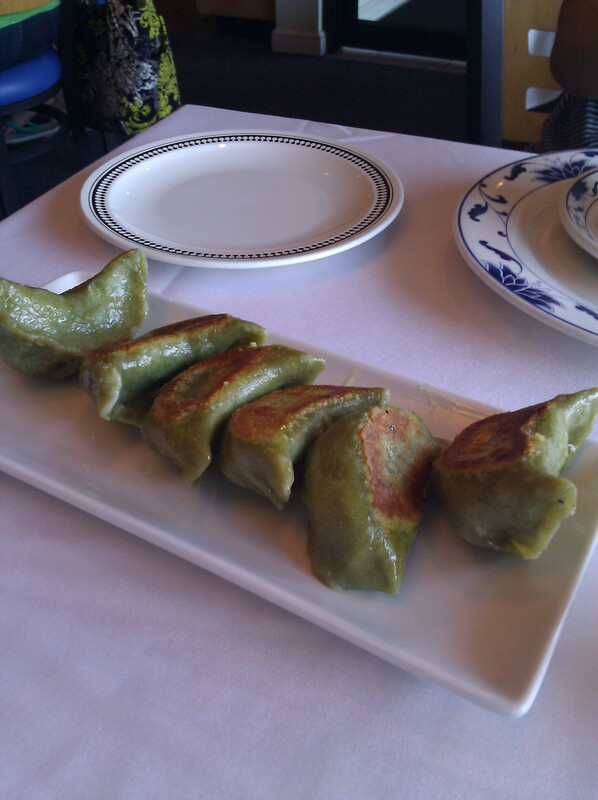 My absolute favorite thing on the Hunan of Solon menu are the spinach pot stickers. I ordered these on a whim one day and did not regret it. After that my meal wasn’t complete without an order of spinach pot stickers. 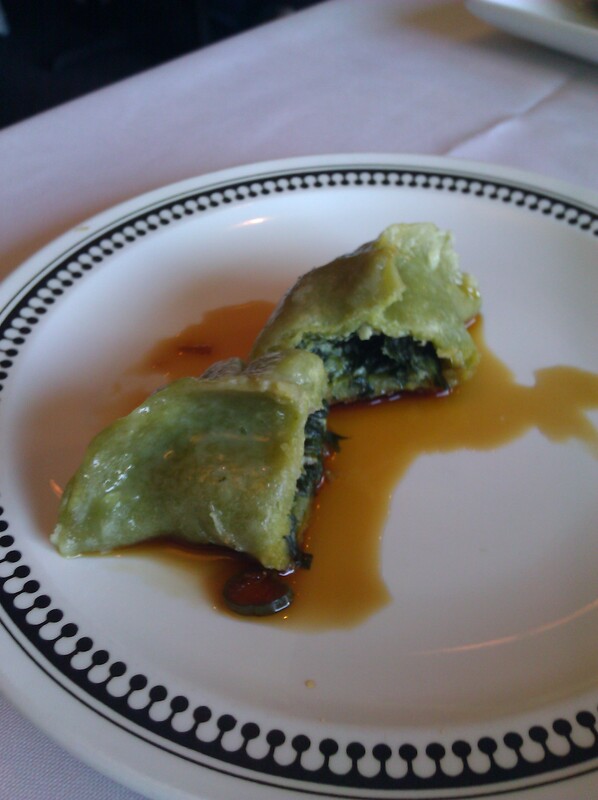 The pot sticker dough has spinach in it, and it is stuffed with a mixture of spinach and cream cheese. The pot stickers are pan fried to have a nice crisp base, but you can still really sink your teeth into these doughly little pillows of heaven. It is served with a dipping sauce that most likely features soy sauce but is not overly salty. If you are a fan of spinach or cream cheese you simply must try them. I guarantee you will order them every time afterward. I could have been happy with just the soup and the pot stickers, but I was also looking forward to ordering my favorite curry on their menu, the Panang curry. The Panang curry is the mildest of their curries. It is a sweet and spicy dry curry, featuring dried chili peppers, coconut milk, butternut squash, yellow squash, snow pea pods, cherry tomatoes, onions, and green beans. I am not a big fan of heat – in fact I order it mild, a fact I overlooked when I ordered this time. However, it didn’t detract from the meal. I love biting down on the cherry tomato and having it burst with flavor in my mouth. I ordered the seafood curry, which included lobster, scallops and shrimp. I only had to remove lobster shell from one piece of lobster. The seafood was perfectly cooked, and the coconut milk, seafood and vegetables all blended together for a delicious meal that I have missed in the last two years. 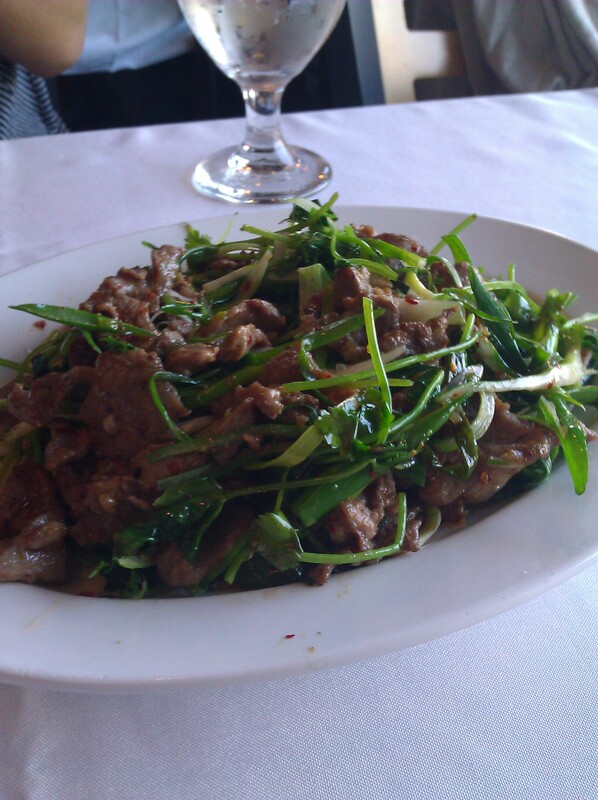 G. ordered #50 off the authentic Chinese menu – lamb with cilantro and scallion. She was debating between three things on the menu, and the waiter recommended it. I got to try a bite, and it was very flavorful. She had ordered it with a medium heat, and this dish packed some heat that snuck up on you. The fresh cilantro and scallions complemented the lamb very well. Without the Groupon our meal came out to $56. G. picked up the tab after the Groupon was deducted, and I plunked down the cash tip. We enjoyed catching up with each other and hearing each others’ plans for the summer. There was no need to dress up for Hunan. The restaurant was populated with young and old and several tables of regulars, including numerous tables of Chinese families enjoying authentic meals. All in all, it was a delightful and relaxed way to spend a St. Patrick’s Day evening. I’ve been meaning to try their Chinese menu for a while. You may have just convinced me to round up some Chinese food lovers for a meal soon! I immediately thought of you when I realized they had a Chinese menu 😉 .